A toll gate and toll keeper's house are depicted at the junction with the road to Earl's Court. This road was in the care of the Kensington Turnpike Trust, together with another 16 miles of roads in West London. 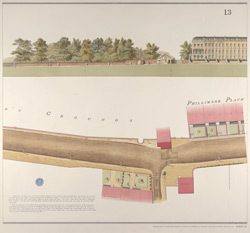 To the left of the toll gate, Lord Holland's Grounds are shown, on which site Holland Park now stands.